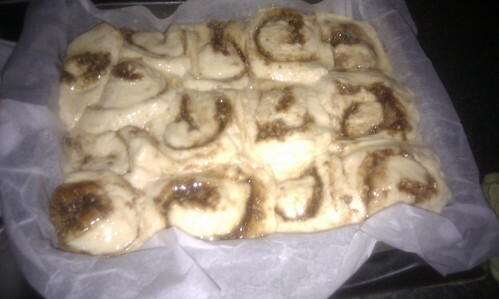 Which I burnt. Things I learned: a four egg mix is a good amount for my sandwich tins. 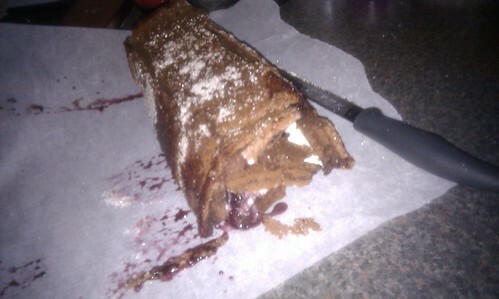 2oz of buttercream is not really enough to fill it and it takes an awful lot of jam. I need to turn the oven down. It’s really enough to combine the mix quite loosely – I would normally cream the butter with the sugar quite vigourously before adding the eggs and flour. This recipe calls for all the ingredients to go in at once and only basic mixing. And it’s fine for it. 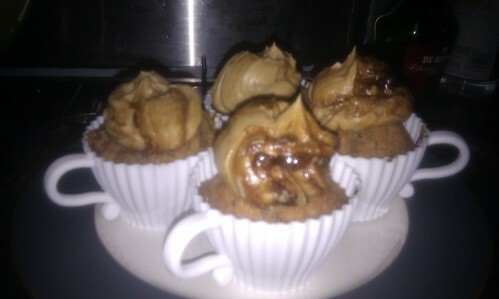 Things I learned: a one egg sponge mix is ample to fill all four of the dinky new cupcake moulds I got for my birthday. Two spoons of instant coffee for the buttercream and two in the cake mix is about right for my taste but a bit too strong for everyone else. I need to work on my two tone icing technique and on icing more generally. An old favourite. I don’t think I’ve ever made them without burning them a little, however – in this case, although they looked blackened they didn’t taste burnt at all. What I learned: the recipe fits neatly in my large rectangular roasting tin – I’ve always used my round 9″ cake tin before. If you leave them to prove whilst ringing for a wedding, they will likely go over the top of the tin. But they will still taste delicious and wonderful anyway. This recipe is a good’un and came out with the desired highly squidgy interiors. 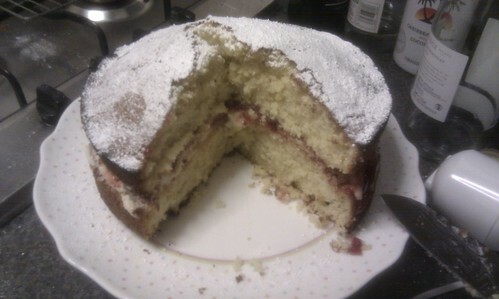 The recipe is extremely detailed, and I might have glossed over the finer points. I had to pop off to Dunelm to buy a new tin for making the swiss roll needed for the roulade, and whilst I was there, bought a square tin for brownies and tray bakes, which I have felt I needed for a while. This recipe fills it really well. 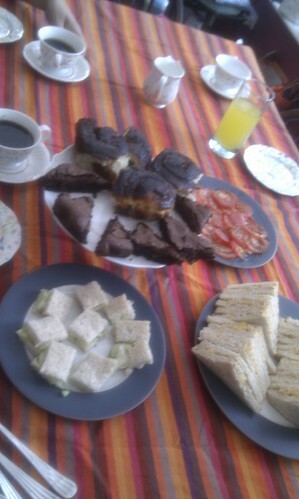 The picture shows afternoon tea with tuna and yellow pepper sandwiches, a small plate of cucumber sandwich bites, strong black coffee, and brownies and cinnamon buns for after. 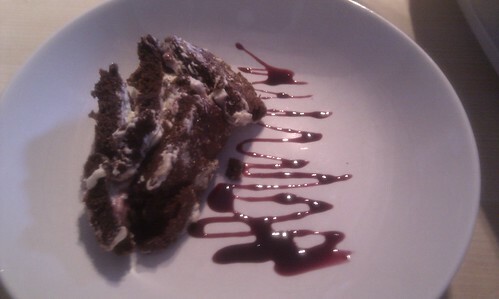 Perhaps the main thing I learned is that my mobile phone takes horrible food pictures! Veteran languages ICT guru Joe Dale retweeted a language teacher new to Twitter asking for interesting teaching and learning links. New to twitter. Send me some interesting #mfl and #teaching links. A slightly obfuscated post for sure, so here is a bit more detail. Just a fab series of photographs taken around the world, including the UK and on many other continents, of what classrooms and children look like. There are many things the same and some striking differences. What struck me? Several countries’ school uniforms look distinctly military to me. How interesting. I’m a big fan of Dom’s MFL page. He’s a languages teacher with some interesting ideas. He blogs quite infrequently, but when he writes something the post is always worth reading. His idea of using Venn diagrams is awesome. It can be done with very little preparation, can be done on mini whiteboards, (une ardoise (ie a slate, also used in the French phrases around having a tab in bar) in French – what is the German for them?) good for thinking skills and as a plenary in that it gets students to show you what they have understood. Class Dojo is an awesome website I am itching to try with students. Little monsters represent your class on the board and you can use it to give them positive and negative behaviour points. Pretty cool just like that. For me it will help me learn names; for them it will help reinforce my classroom rules. Best of all? You can log into it simultaneously with your whiteboard and your mobile phone, and allocate points to students as you go around the class. Zondle.com is a website for playing games with vocab lists. You can set a learning homework for students to go and play games. You invite them using their school email addresses and you get a record of how often they have played the game. Once you have taught the website a vocab list, you can play any of a number of games with that one list, so students can choose the games to suit them. There are stereotypically boy games and stereotypically girl games as well as more neutral types, and because the students choose, it’s up to them whether they stick to stereotypes or not. The blog post itself has over a dozen ideas for teaching telling the time, which is one of those topics which is important but that isn’t immediately easy to make interesting. 1) I have wasted a lot of time on the internet in my summer holidays. But lots of good teaching ideas are going into my mind too! 2) I think increasingly it isn’t so much about making resources as building up places to look. TES is an obvious one (albeit with lousy search). MFL Twitterati and the MFL Resources list are also great. 3) MFL Twitterati 10 minute challenge. Click the link. Spend ten minutes a day/week looking at what other practitioners are doing. Something there will surely inspire you. If you are inspired, join in the conversation and share your own good practice. 4) There’s no way I will be able to keep up with these groups and soc med practices in term time! Bank your good ideas now. Several of our friends have been part of the back-garden chicken revolution for ages, and so when some of them decided to upgrade their chicken house from v expensive to eye-wateringly expensive I jumped at the chance to buy their old housing at a knock down price. It’s taken a few weeks to get the garden ready, and it also didn’t seem fair to stock up on livestock shortly before going on holiday. But last weekend, with the garden and hen house sorted out we popped along to Hens For Pets out near Ikea to get our chooks. 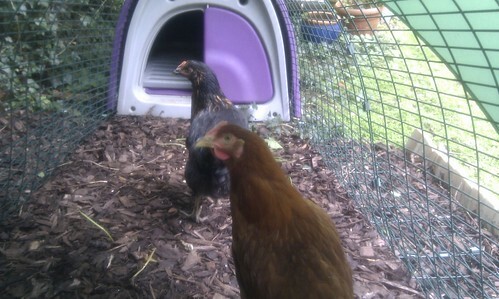 They’re “point of lay”, apparently, but it might take up to five weeks before we get any eggs. The girls seem reasonably well settled into our garden now, scratching around the bark and hopefully avoiding the poisonous ivy and elderberries growing perilously close to the housing. 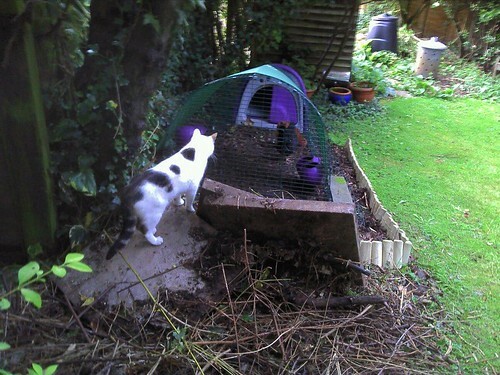 The first days, the birds seemed pretty nervous, and we could hear them clucking when cats got too close. Our own cats don’t really seem to have the bottom of their garden in their territory, but it seems to be a free-for-all for a coterie of black and white neighbour cats. Now it seems that both the chickens and the cats have figured out their can’t get through the wire of the run and although both are fascinated by each other, the chickens have stopped the cluck frenzy and the cats have stopped trying to rush the run. The morning/afternoon routines seem reasonably easy to handle, but I haven’t done a weekly mucking out yet. We’ve only been able to fit the coop a fair way from the house, so the biggest thing I’m worrying about right now is forgetting they are there. Liberal England’s recent post promoting a Shropshire rap reminded me that while we were in France our hosts told us about a Hereford rap that was quite entertaining. The words and the content pursue some rather adult themes. But it is nice to see all those photos of Hereford cultural landmarks. And an indication of how long I have been gone. A Primark? In Hereford? You’ll be telling me there is a Starbucks next.